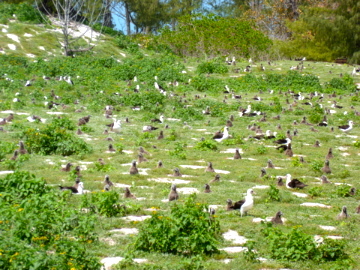 Emily's Journey to Midway: "In this Midway Place"
Midway Atoll is the most beautiful place I have ever been in my whole life. From the moment we stepped off the air plane all that you could hear was the amazing voices of the laysan Albatross. They have the most versatile calls, from mooing to clapping these guys will certainly keep you awake all night. When you look outside, all that you can see is what appears to be a sea of birds and in places you can hardly walk through all of them. Its truly a wonderful place full of so much beauty. The ocean is breathtaking and it shines colours of blue that I have never seen before in my life. I could go on for hours about the magnificence of this remote place but there's also this strange presence of an extreme horror. Today Chris Jordan dissected a baby albatross and through heart wrenching tears, we found nothing but plastic within this already dead albatross chick. So that means that from such a young age these birds are being fed our garbage. It is horrible. Its such a strange paradox to see this dead bird, filled with plastic garbage yet all around him was other albatross' doing their amazing mating dance. It's so strange to see so much death and new life all coming together. That is what I've been struggling with here on Midway and it's only the first day. We're surrounded by ultimate beauty in this utopia yet there's this awful cycle of death happening all around us everyday. That must have been soo difficult to see. Can you see the plastic in the ocean or on the beaches?